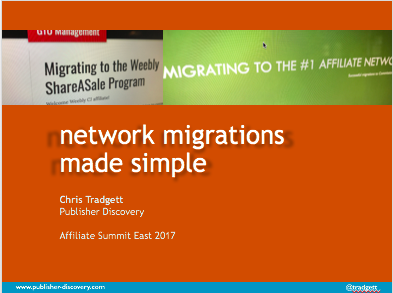 In my #ASE2017 session on migrating your affiliate program, I outlined a key aspect of moving your affiliate program that most marketers ignore or pay too little attention to – potentially at their peril. There have been many posts and articles written about the numbers of steps you need to pay attention to in moving your affiliate program from one network to either another network, an in-house network or a tracking technology partner. Most of the issues around planning and implementation have been amply explored by some of the best thinkers and writers in our industry. What has been little touched on has been the aftermath from moving networks. Your active affiliates with whom you have most contact with should be easy to work with for migration and most will happily change links. Bear in mind that for many affiliates, your decision can make a pile of work in finding the links across what may be many websites. It is worth using your inbound link analysis logs (if available from the network) to understand the pages traffic is being referred from. That way you can provide valuable information to the affiliate on the pages where there are links that need changing. I recently heard an OPM state that their client having initially only allowed for 1 month overlap of the networks to migrate, then cut that to one week. Many of those affiliates may not have read the email informing them of the change in that time. It is important to allow sufficient overlap time of at least a month for affiliates to change their links from the old program to new tracking. It may be worth incentivising the affiliates to change links, perhaps with enhanced commissions for the overlap period. However well you have managed those affiliate link transfers to your new network, there will always be a few that don’t get changed. That’s many affiliate managers will tell themselves anyway – however, the reality can be a very different picture. 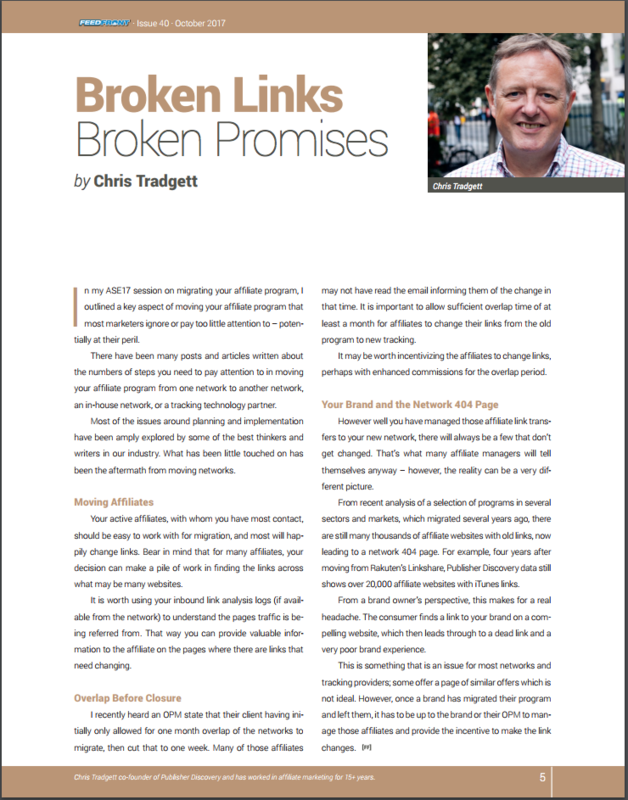 From recent analysis of a selection of programs in several sectors and markets which migrated several years ago, there are still many thousands of affiliate websites with old links, now leading to a network 404 page! As an example, four years after moving from Rakuten’s Linkshare, Publisher Discovery data still shows over 20,000 affiliate websites with iTunes links! From a brand owner’s perspective, this makes for a real headache. The consumer finds a link to your brand on a compelling website, which then leads through to a dead link and a very poor brand experience. This is something that is an issue for most networks and tracking providers; some offer a page of similar offers which is not ideal. However, once a brand has migrated their program and left them, it has to be up to the brand or their OPM to manage those affiliates and provide the incentive to make the link changes.